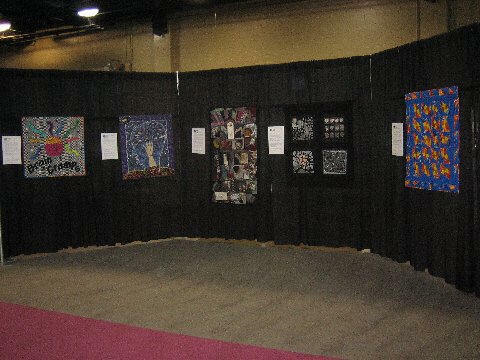 AQS gave us an enormous amount of space to showcase the exhibit. I paced it off and it was the equivalent of 24 booths. This, in itself, was amazing. The stanchions were set so that most of the quilts had 10 feet all to themselves. Unheard of. They formed 3-sided alcoves which made the setting feel intimate and somewhat private, with just 4 quilts per. I think this set was the most crowded. Sonia Melichar Callahan was an exhibiter for her entry in the Alzheimer's Awareness part of the show. She was one of the only 25 who were accepted in this show - quite an honor! She has exhibited nationwide for years and I have had the privilege of seeing her work at the Houston Show. As the above mentioned Alzheimer's show will travel all over the USA, it may be of interest to some of our class members, or other classes who knew Sonia. 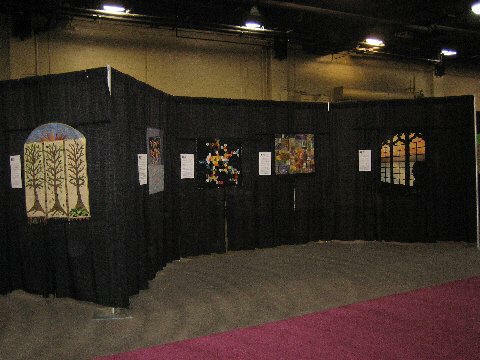 The drapes were black and I set the poles so that the quilts were fairly low. (I find it annoying to look at quilts through my bifocals and have my neck feel like it's breaking off after three quilts.) Ditto for the signs. The poles wore black "booties" so that they disappeared into the black drape. It looked elegant. After they hung, I had a good cry. Spreading them all around the furniture in Mom's room upstairs was a fair way to put them in order, but here they were hanging as they should be. Seeing all the quilts in the stillness of this very large (156,000 square feet) hall the next morning before the quilters were let in was quite humbling. I reflected over the past year and the work of so many hands to get this far. The talent in that corridor, YOUR talent, was amazing. I put the quilts in order by theme and then by color. Since many quilts spoke of more than one aspect of the Alzheimer's experience, it was not completely linear, but I wanted a beginning, a middle, and an end. 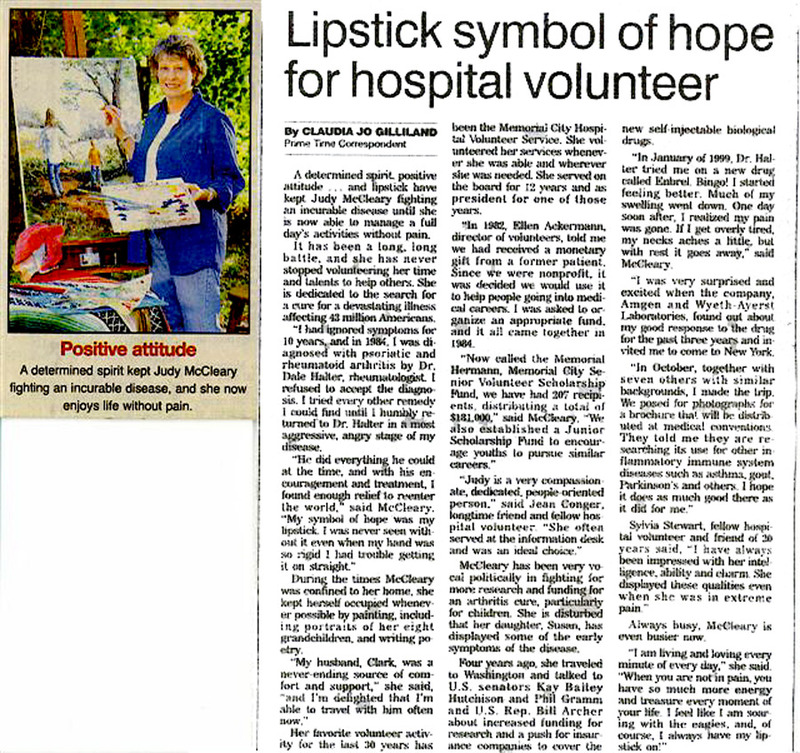 I began with the quilts that told an overall story of what AD is all about, then moved into early diagnosis, caregiving struggles, anger, acceptance, and finally tributes. Again, this wasn't a straight path by any means. I think only 5% of the people actually saw the quilts in order. There wasn't a person in the hall, down to and including some of the hotel workers, who didn't say Alzheimer's at least once. Not everyone saw your quilts, but they knew about them. (This too is raising awareness.) It also didn't hurt that we were the short cut to the lunch line. Wednesday was slow, but the pebble had been dropped into the water. We saw the ripples expand and reach more quilters in the subsequent days. Several times I counted upwards of 50 people seeing the quilts at one time, individually, clustered together, holding on to each other, obviously moved by what they saw. You could hear the chatter and commotion of the rest of the show in our aisle…because it was so quiet there. It was hushed, almost reverent. 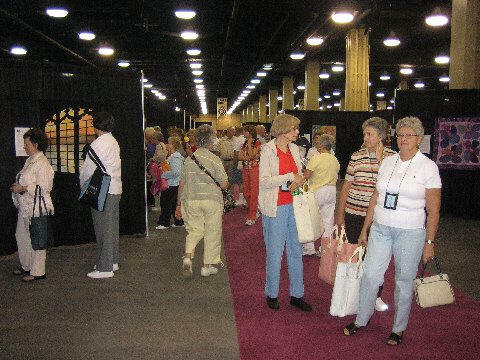 It was a hard show to see, yet quilters encouraged each other to go see our quilts. Most who looked at them and read the signs cried. Many people came to our info table sobbing, barely able to compose themselves. We went through 4 boxes of tissues. Throughout the four days I heard comments about every single quilt. Know that the work that came from your hearts touched many, many people. I will share one story, although there were so many. There was a couple standing in front of Sonia Callahan's "Alzheimer's Thief," wiping tears from their faces. One of the AQS hostesses went up to them to comfort them. The husband introduced his wife and said she had just been diagnosed with AD. She pointed to Sonia's quilt and said, "This is what it feels like!" Some wrote comments in notebooks we provided. I'll try to transcribe their comments and put them on the web page. But most did not write anything. I think they were too overwhelmed. I don't know how many people I hugged; I lost count. The CDs were a huge hit. AQS suggested I bring 50. I had 25 done in time and brought all the parts for 200 total. At night I burned the rest in the hotel room and assembled them. We sold out, and then some. Two different publishers approached me to turn the exhibit into a book, a plan all along, but really nice that other people thought it would be a good idea too. Many people asked about a book. I will put a link on my web site soon so that you can order the CDs there and tell your friends. First I need to get the CDs burned for the Harrisburg show. A highlight of the show for me was meeting the four artists in the show who attended: Judy Szumlas (and her sister), Janet Heliker (and her husband), PhiloMena Mudd (and her sisters-in-law), and Elsie Campbell. I also got a chance to thank many people who have made Priority: Alzheimer's Quilts. 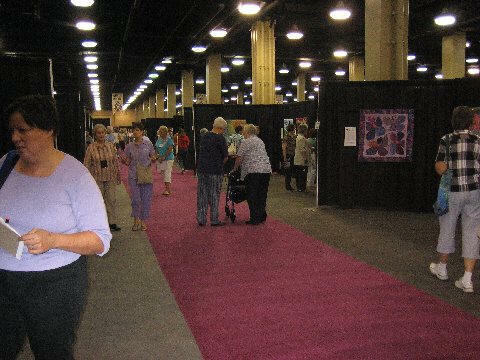 The only disappointment was that the local Alzheimer's Association was too busy to send a representative. Your quilts are already in Pennsylvania, safe and sound. They arrived today (Tuesday.). The local Alzheimer's Association is ready to rock and roll for us and I'm really going to miss not being there. Please tell me if you are going to be attending the show so I can alert them and the Mancusos for some added publicity. If you can White Glove, that would be fantastic. I will announce what I need in the Sept 1 newsletter. 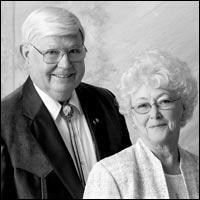 WAVERLY — Vivian K. Larsen and Roger L. Hesse are announcing their engagement and approaching wedding. 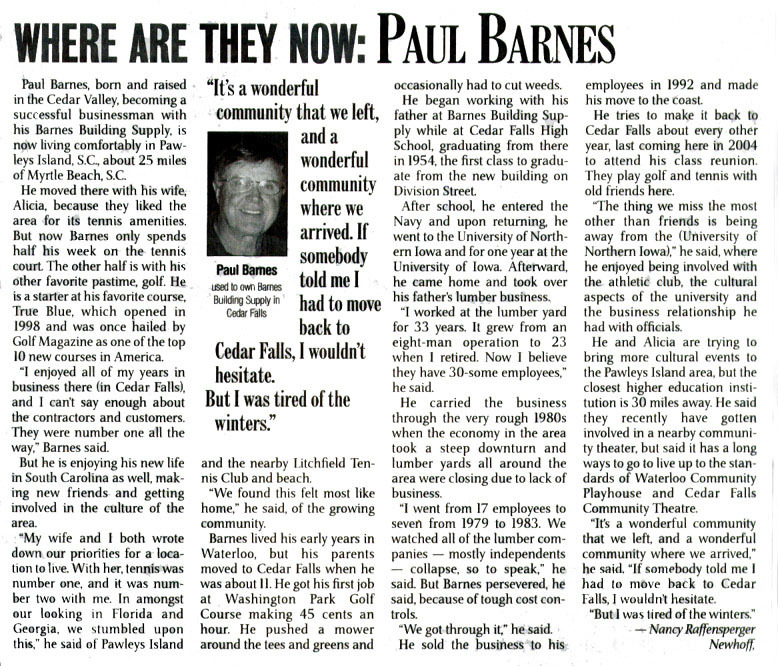 The groom-elect is a Realtor, developer and marketing representative, and the bride-elect is retired. The couple will exchange vows at Finchford Community Bible Church this June. "My family and I are extremely disappointed by media reports comparing Doug Eddings' lousy call with mine and suggesting that he 'pulled a Don Denkinger.' This is highly insulting and seeks to undermine my very legacy. "Clearly, Mr. Eddings' blown call in no way approaches the magnitude of mine. "He merely extended the second game of a League Championship Series by incorrectly signaling an out, and then deciding that maybe it really wasn't an out because the catcher failed to catch the ball, which he could not have seen being behind said catcher. "As you may recall, I ruled in 1985 that Kansas City's Jorge Orta had reached first base safely even though the play unfolded directly in front of my nose and replays indicated that he did not reach the bag before first baseman Jack Clark's toss to Todd Worrell, who was covering. "Moreover, this occurred in the ninth inning of Game 6 of a World Series with the Cardinals leading that game 1-0 and leading the series three games to two. "Kansas City went on to win that game as well as the series and will probably someday induct me into their Hall of Fame. "With all due respect to Mr. Eddings' well-intentioned effort to wrench the torch of infamy from my grasp, I cannot state strongly enough that I will fight any such effort with all the considerable resources I can bring to bear.